Packed with hearty vegetables and taco flavors, this dreamy, Easy One Pot Taco Stew recipe is a hit for all your winter entertaining needs. 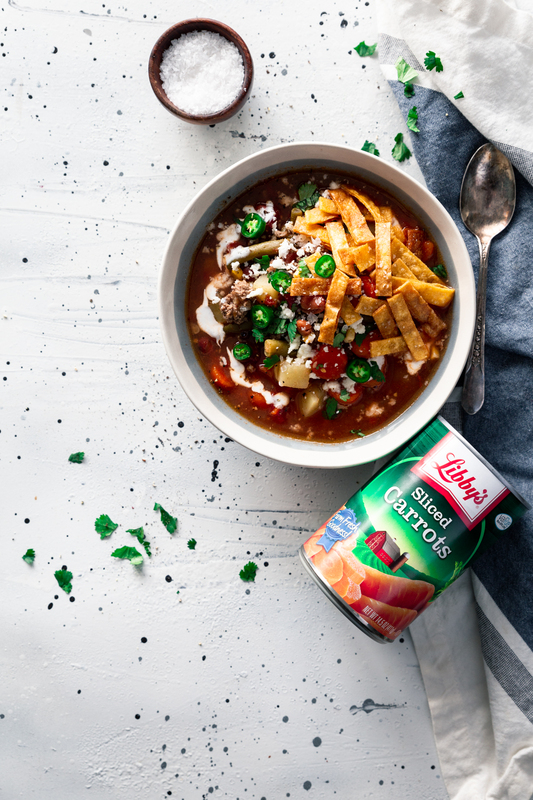 Slow-simmered in a simple water-broth combo, you could easily call this a taco soup, but I’ve added chunky potatoes, pinto and chili beans, and three different varieties of Libby’s® Canned Vegetables, for a dinner that’s more akin to a beef stew that took a detour to the spicy south. 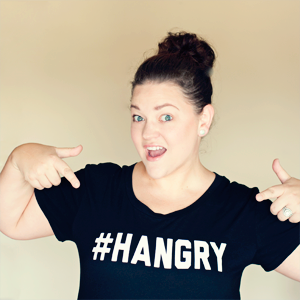 It’s time to warm up this winter with a recipe worth savoring, and if you follow my prep tips below, you’ll be sipping on stew in no time! 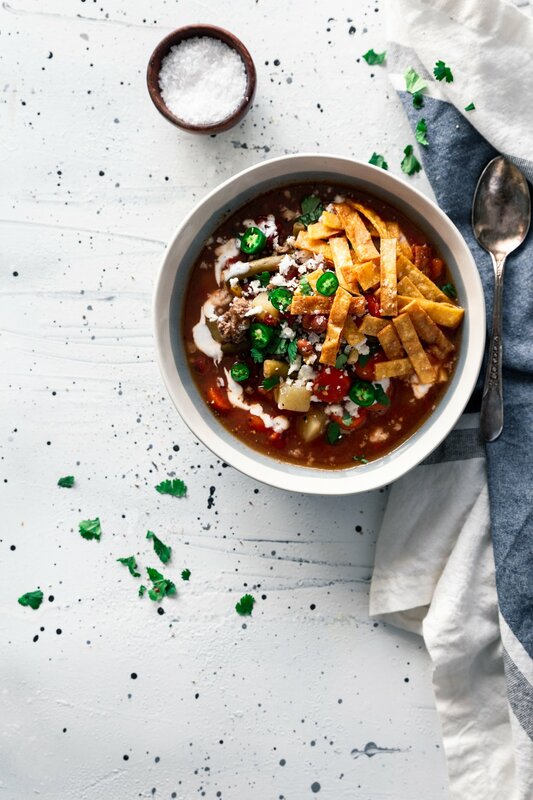 I adore this taco soup. Taco stew? What would you call it? In general, the difference is simply the amount of liquid involved. Simple, right? 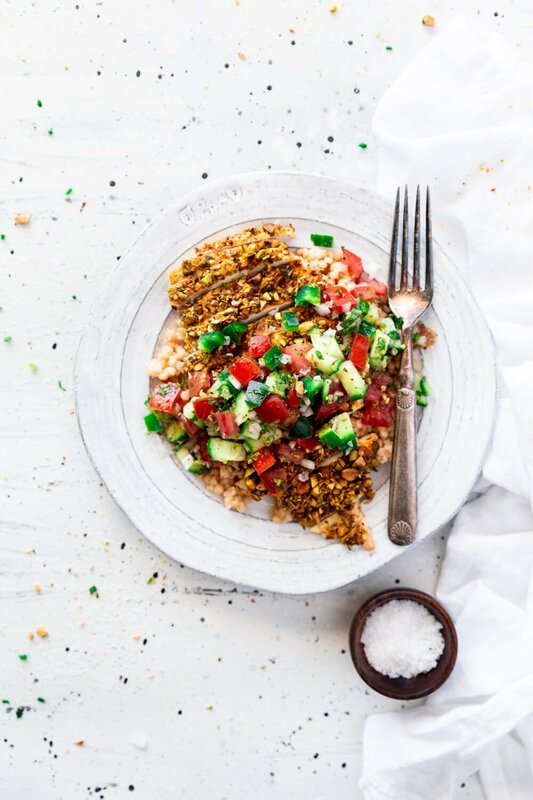 But this bowl of deliciousness is so jam-packed with hearty beef, vegetables, and spices, that you could easily classify it as either. 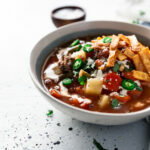 Born from a desire to escape the -55 degree temperatures we were saddled with here in Minnesota, I was able to pull almost every ingredient straight from my pantry. This soup is absolutely a pantry staple, and finds its way into our meal rotation at least once per month. What all goes in taco soup? I also threw in some yellow gold potatoes and used a combo of water and beef broth in addition to a few other noms. But that’s only if you follow the recipe exactly, using my taco seasoning. 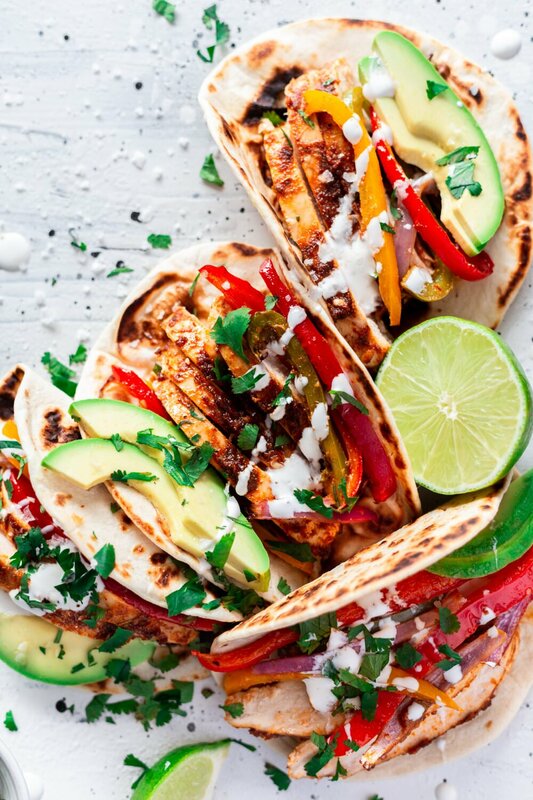 If you substitute the taco seasoning for a packet, you will want to check the label to ensure it doesn’t contain any gluten (some varieties use flour as a thickener). 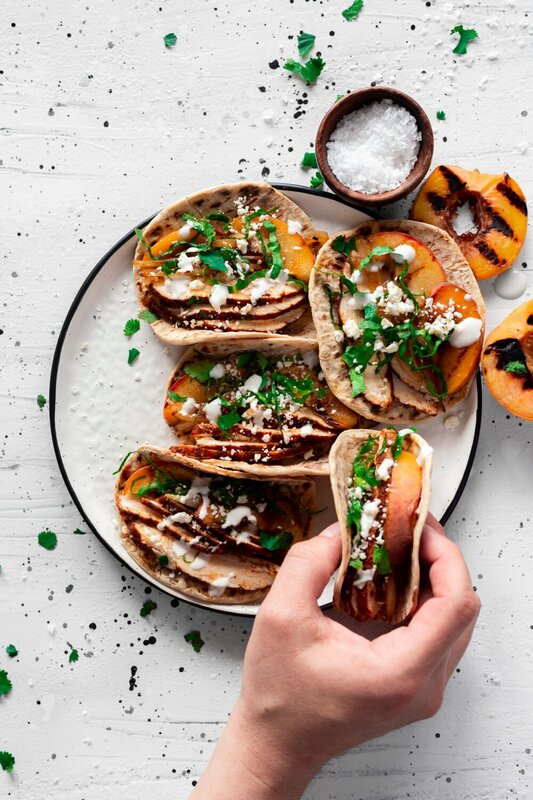 If you fry up your own corn tortillas for a topper, you’re good there as well, but again, if you utilize bagged tortillas strips, you will want to check the label to be sure you’re safe. 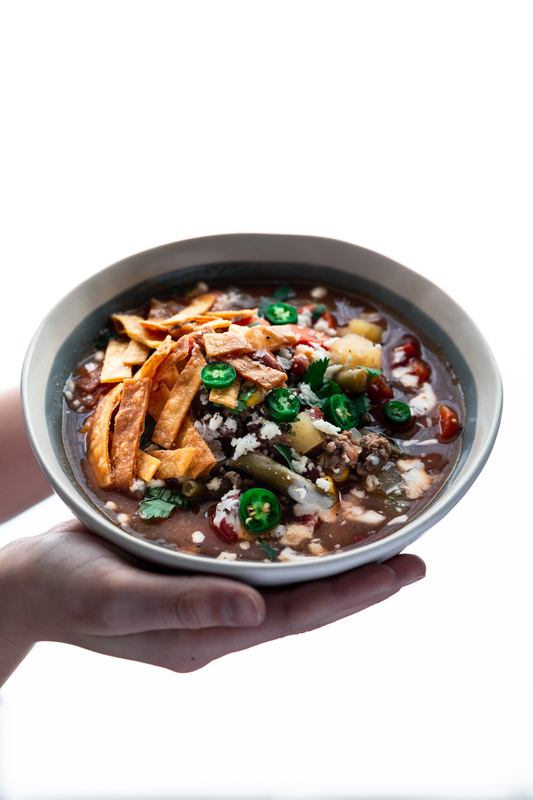 Another reason why I call this taco stew a pantry staple is because of how easy it is to make. Nothing says winter comfort like warm soup, but we don’t have to let the season put a damper on flavor. 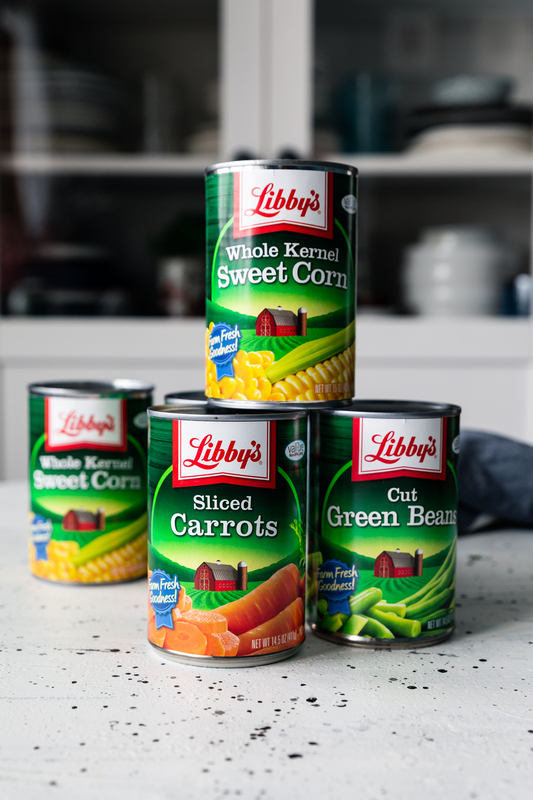 That’s why I incorporate Libby’s® Canned Vegetables to create delicious, quick and nutritious meals in a flash. 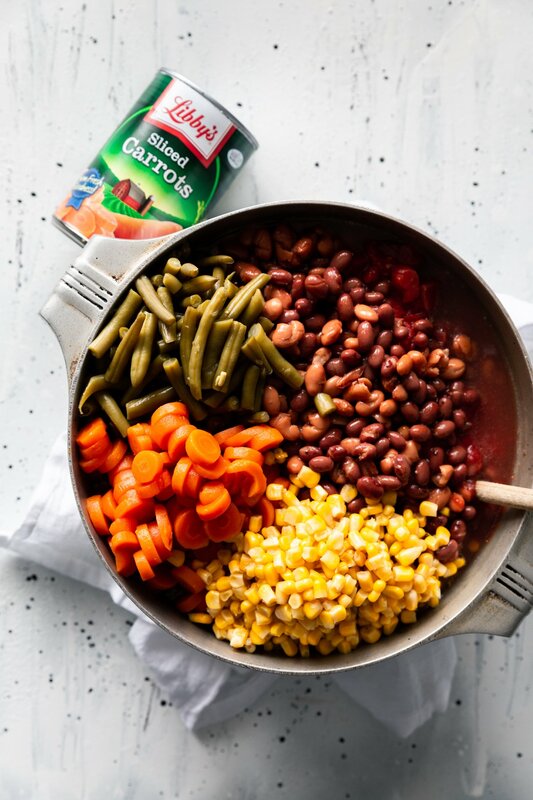 Using canned vegetables reduces prep time by eliminating the need to cut everything, as well as reducing cook time! 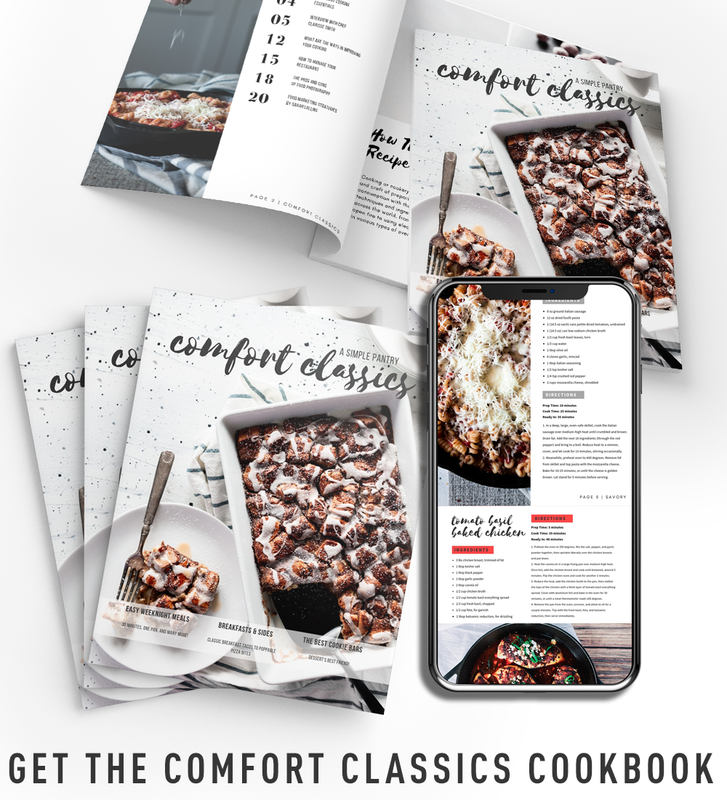 To keep this recipe to one pot, cook the ground beef first and remove it from the pot with a slotted spoon before cooking the onion and potatoes, instead of utilizing a second pan to cook the beef before adding it to the pot. Yes! 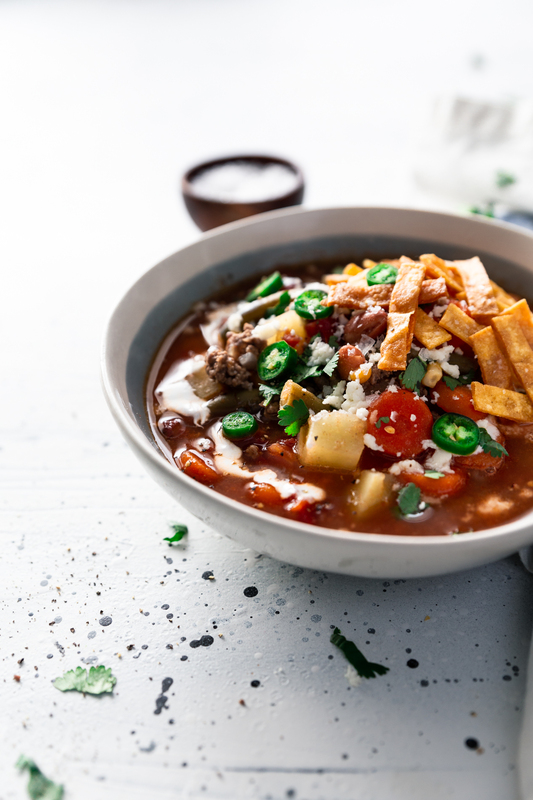 Stews freeze really well, so just wait for it to cool, then place it in a freezer bag or container and freeze away. It can be stored for up to two months if you press out all the air and seal it properly. 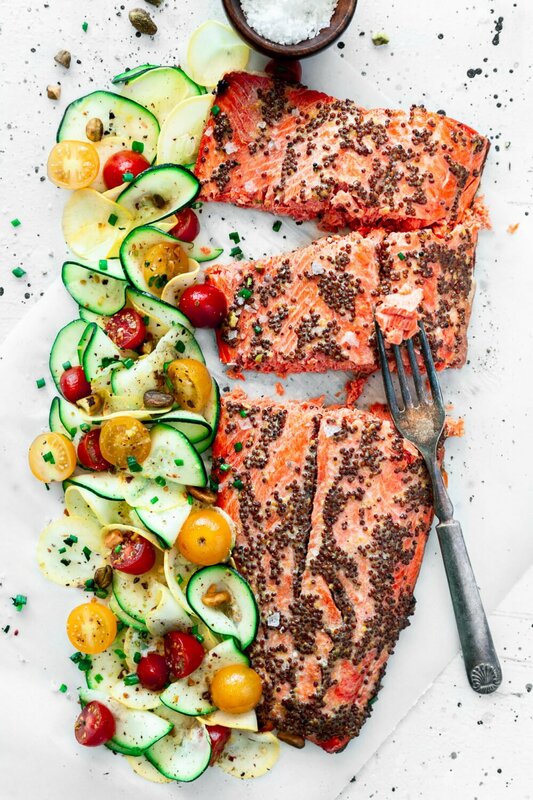 For recipe ideas and inspiration on how to incorporate Libby’s® Fruits & Vegetables into your meals, visit www.getbacktothetable.com. 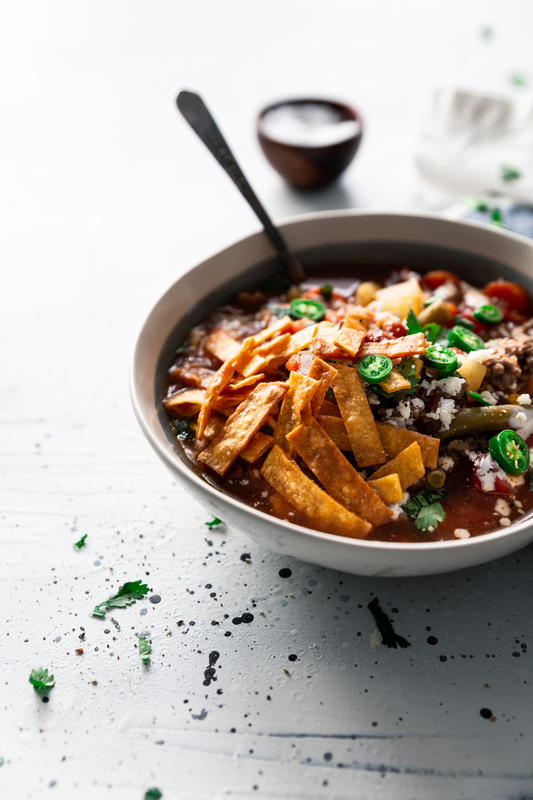 Perfect for winter entertaining, or just to empty out the pantry, this Easy One Pot Taco Stew will definitely hit the spot for dinner. 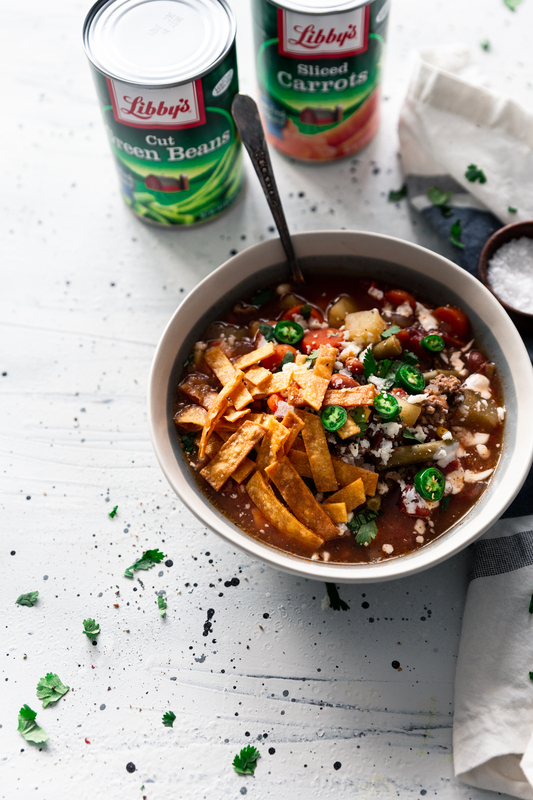 Filled with delicious vegetables like green beans, carrots, and corn, and a hearty dose of spicy Tex-Mex seasoning, this is a taco soup that will easily find itself in your meal planning rotation. Heat a large dutch oven over medium-high heat and add the ground beef. Sprinkle with salt and pepper and cook, breaking it up as it cooks, until no longer pink, around 5 minutes. Remove from the pot with a slotted spoon and set aside. Drain and wipe out the pot. Add the olive oil and heat to medium, medium-high. Add the onions and cook until soft and translucent, around 3 minutes. Add the potatoes, followed by the water and beef broth, then bring to a boil. reduce heat to a low boil and cook until the potatoes are soft, around 10-15 minutes. Once the potatoes are soft, add the ground beef back to the pot, followed by the cans of Libby's carrots, green beans, and corn, the red chili beans, pinto beans, tomato sauce, diced tomatoes, cumin, coriander, chili powder, and garlic powder. Stir gently to combine and simmer until hot. 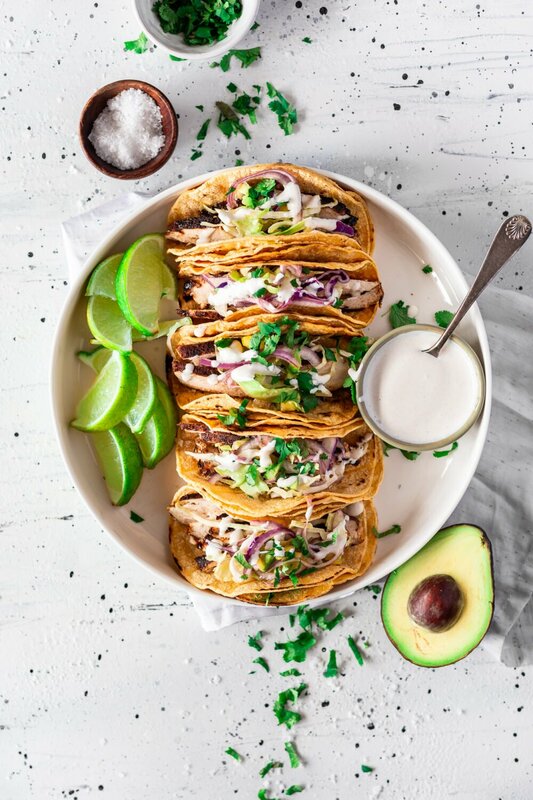 Serve with your favorite taco toppings. This soup is absolutely amazing!! !